What kind of Guitars does Chino Moreno use? Click here to let us know! 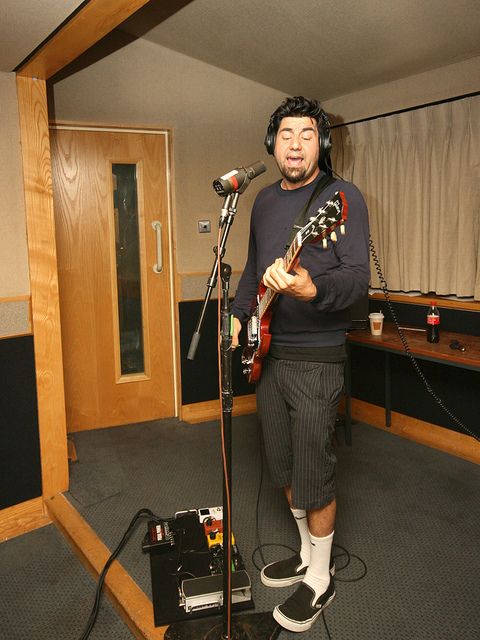 Chino is seen using a Knaggs Keya T2 onstage with Deftones in this picture. Made in Korea with 24 jumbo frets. Abalone flag inlays. Mahogany body. Transparent dark cherry finish.  Passive electronics. 1 volume, 1 tone knob, and a 3-way selector. Two EMG-HZ passive humbuckers. In this video from the 2013 Long Beach Guitar Center Expo, Chino Moreno can be seen using a Gibson SG Standard electric guitar. Chris posted this photo of him using a brown Squier jaguar. Chino is seen using a black HSS Fender Strat in this 2010 performance of "Beauty School". In this 2016 performance of "Swerve City", Chino is seen using a White Gibson SG Special. This picture from July 2016, taken by Drew Foppe, Chino's technician, shows the modifications of Chino's sunburst SG Special. In this 2016 video of "Beauty School", Chino is seen using a Yamaha Revstar. Vidéo from 6.22.17 Tampa, FL. The song played is Rosemary. This Guitar as the Les Paul 100 on the neck. Listed on Chino's official Yamaha artist page. What kind of Amplifiers does Chino Moreno use? Click here to let us know! This article by Orange Amplification reads, "Chino Moreno uses a Thunderverb 50 paired with a PPC412…"
This photograph of Chino's 2016 rack, shows that he is using the Rivera RockCrusher with two Orange Dual Terrors. Drew Foppe, Chino's guitar tech: "...Using the 50 watt Tre Reverb and the 100 Watt backup..."
Green Matamp Head is clearly seen being played here by Chino through entire video. What kind of Effects Pedals does Chino Moreno use? Click here to let us know! Here you can See Chino with his pedalboard.  A MXR phaser can be see toward the bottom right of the board. Confirmation of this being the 45 specifically can be found in this image. In this image you can see a Mini Chorus to the left of the phaser pedal. A close up shot of this board can be seen here. 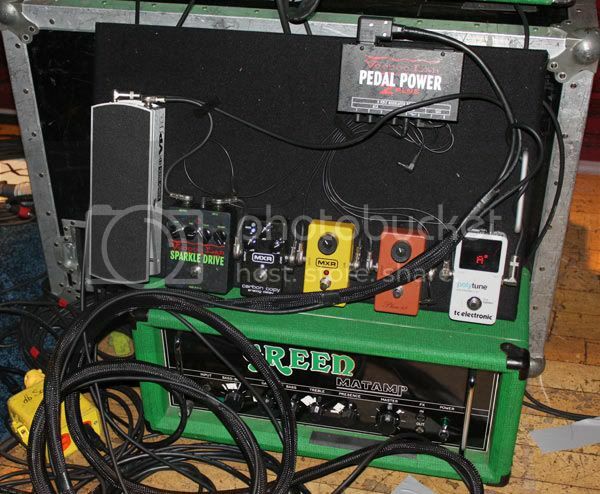 In this 2010 picture from Premier Guitar, an Ernie Ball 6181 Vp Jr is seen at the far left of his Pedalboard. “The chorus pedal is rare. My buddy Aaron gave it to me, and out of all the chorus pedals I’ve tried, this one’s the most soothing and has the loveliest sound. Chino Moreno's gear is on Equipboard.